When I started this journey in 2011 I spent a lot of time out at the windmills just north of town. I photographed them from many angles trying to find out what made a good photo. One spot that I liked was at the end of this drainage ditch. I had the idea to head out that way early Wednesday morning never thinking about a shot like the one above. As I moved out further into the country I wondered how those ditches would look. I was flying back to get a good view of the windmills when I saw this familiar ditch not too far away. I flew over to make this picture, and I was surprised at how much I liked it. Without a true measure of scale this could be any body of water. The tire tracks to clue you in to the fact that it is a drainage ditch though. The colors for some reason just appeal to me. For some reason I have been fascinated with the straight down view from the quadcopter. I have made some photos that I liked from other angles, but the straight down view is by far my favorite. This is just a drainage ditch, but for some reason from directly overhead it becomes very interesting to me. Looking straight down on things turns life into shapes and patterns. Part of the fun of working with the quadcopter will be seeing what works and what does not from different angles. So far I have really focused on the top down angle. I used to test new gear in two locations early on in my photography days. 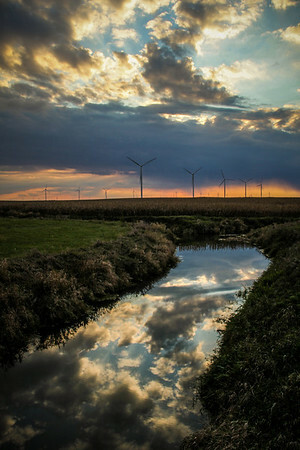 I would head out to a spot near this location to photograph the windmills, and I would test it at a cool tree and gravel road near my apartment and later house. That tree has since been knocked down to build the new west side fire station. The windmills though will be there for a while. I have long since stopped testing my gear at the windmills. When learning something like the quadcopter though it seemed like a good place to get back to. One of my favorite early photos is the one above at sunset with a beautiful reflection in a drainage ditch. 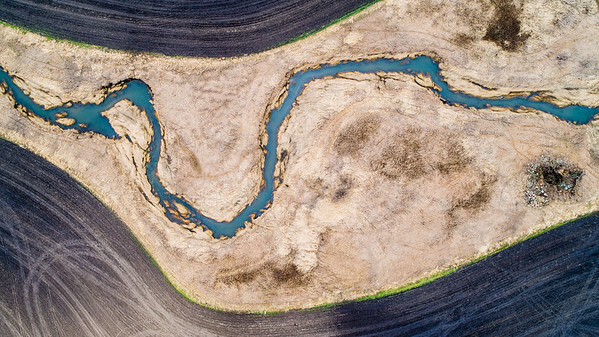 The same ditch is the shown above in my quadcopter photo. Back in 2011 I had no idea that I would be flying over that ditch with a quadcopter. At the time the idea of making money with my photos was laughable. In a way it still is. I know that I have plugged this a couple of times, but here is a link to some of my favorite photos from last week. Having the DJI Phantom 4 Pro has really helped me with my resolution to get outside and shoot more. It has made me look at things in a different way, and has jumpstarted my year off right. Most of that gallery is quadcopter photos that I made. This project of posting my weekly favorites is now a year old, and really helps me see what I have done right during the week. Take a look and tell me what you think.